Little survives of Sir Moses Montefiore’s East Cliff Lodge, a once magnificent mansion and garden straddling the boundary between Broadstairs and Ramsgate in Kent. The grounds of the former Gothic house, demolished in 1954, are now a public park providing valuable green space between the two seaside resorts. The only buildings that remain are a fairly unremarkable stable block and a particularly fine Italianate glasshouse. The grade II* listed structure, which along with other buildings is leased by an architectural practice from the local council, is a delight and quite unexpected in this otherwise leafy park. The delicate, curved outline of the glasshouse is beautifully fashioned from iron and bronze and glazed with ‘fish scale’ glass panes diminishing in size towards the top of the structure. There is nothing remotely Italian about the building, it just so happened that the garden created in front of it was centred on a fountain that Sir Moses Montefiore had imported from Italy. Therefore by association the structure was described as ‘Italianate’. A prettier glasshouse on this scale it’s hard to imagine, but this year something extraordinary has happened to temporarily alter its elegant silhouette. 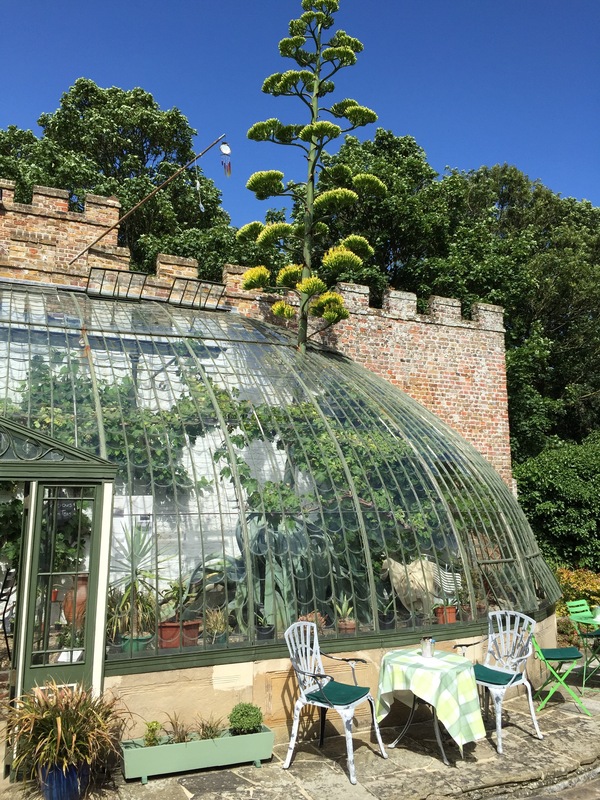 A specimen of Agave americana, moved from a nearby properly about 40 years ago, has formed an enormous 30ft tall flower spike which is now blossoming. This has necessitated the removal of a handful of glass panes to allow the enormous stalk through, so as not to damage the rest of the historic structure. The result is quite breathtaking and has been drawing crowds from near and far. 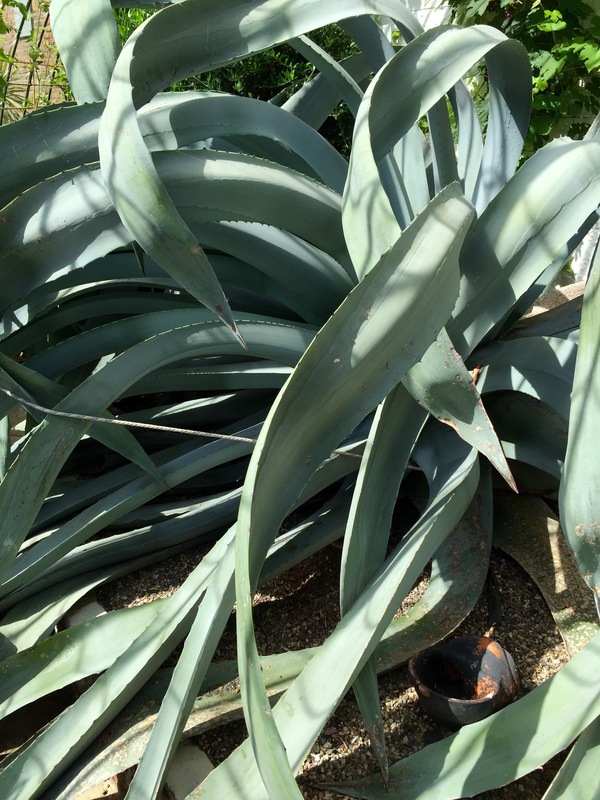 The common name ‘century plant’ leads many people to suppose that Agave americana flowers only after 100 years, but this is something of a horticultural myth. 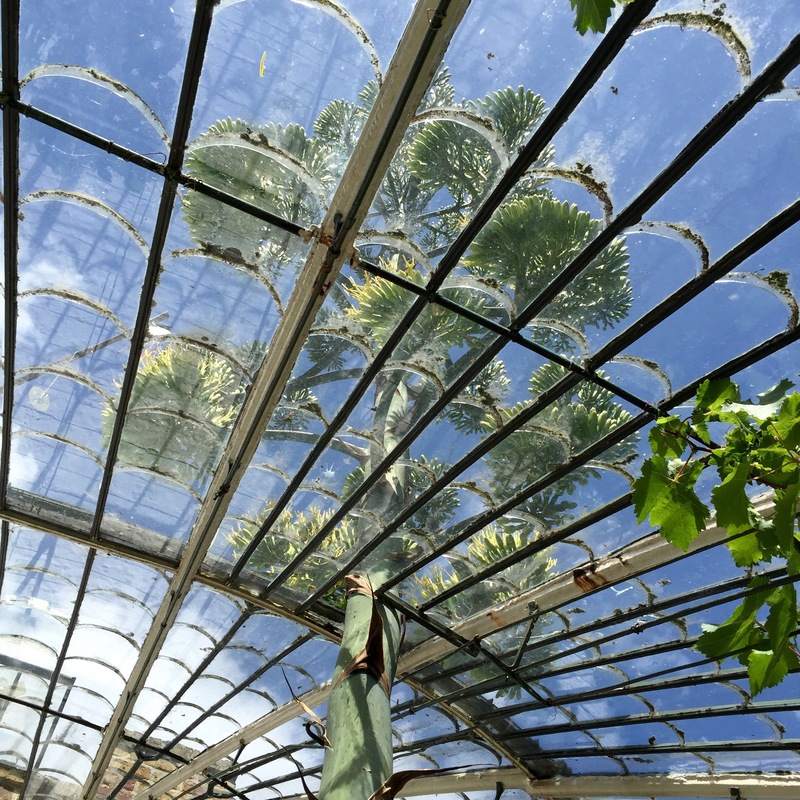 In most instances plants have flowered by the time they reach 30 years old, making the Italianate Glasshouse’s plant pretty ancient, but not a centenarian. However, in this neck of the woods such details are overlooked in favour of a good press line. And, what’s more, the agave that’s flowering now has an identical twin, which must surely be due to flower soon. Speculation is rife. 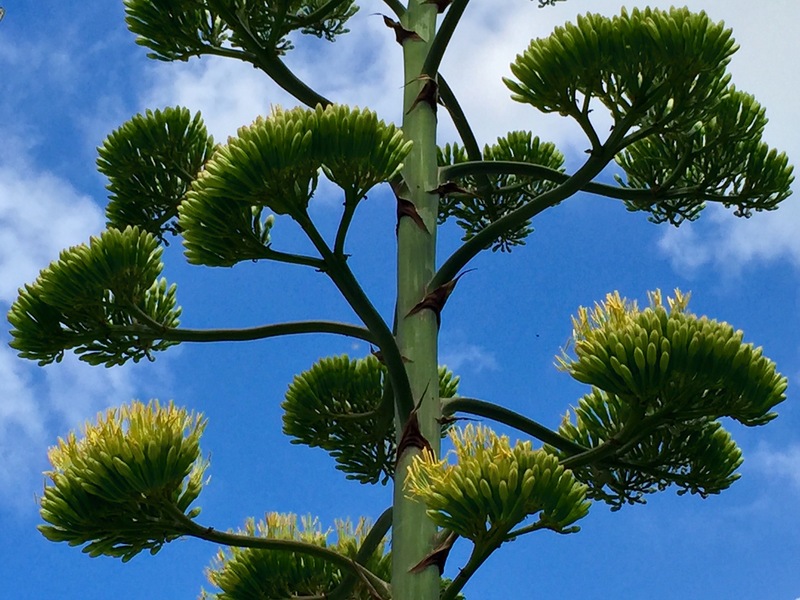 The agave will die after blooming, but not before producing offsets which will one day provide entertainment to the future residents of East Kent. Waiting in the wings is a seven year old pretender which was cut away from the ageing agave before flowering. For now though, plant spectators can enjoy this rare horticultural happening from the comfort of a specially created tea garden situated where Sir Moses’ Italian fountain once stood. There’s nothing American or Italian on the menu, just good English breakfast tea served from mismatched china, home made cakes and freshly baked scones accompanied by a rather unexpected view. 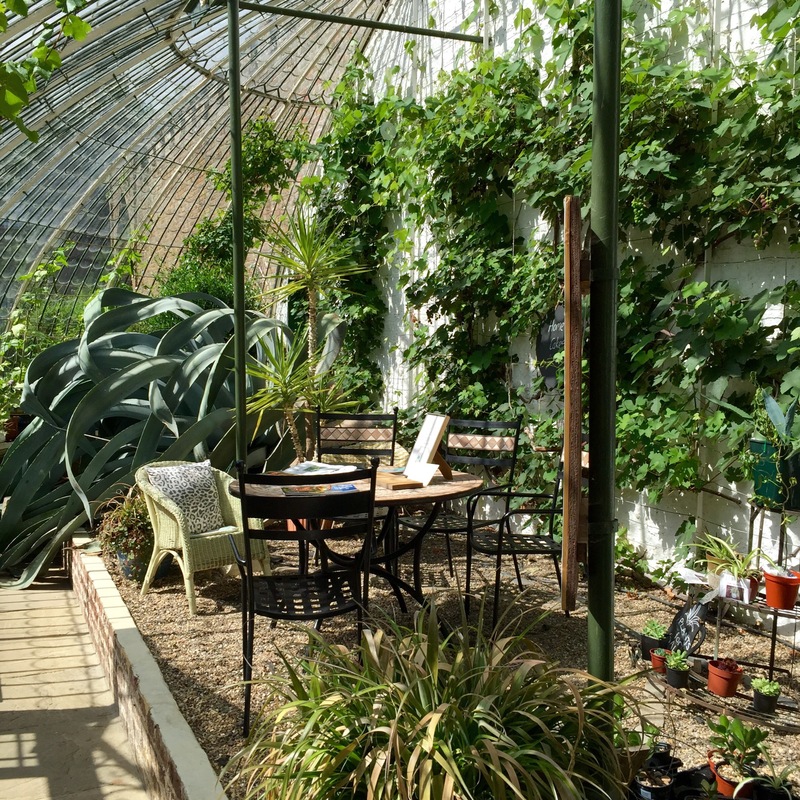 The Italianate Glasshouse is open to the public from 9am to 5pm until September 30th 2015. How fun is that?!!! As a local writer, I get a call nearly every summer from someone who has spotted one blooming for the first time, but they’re fairly common here (South Carolina). Exciting, though! It’s an amazing plant. I love the word “mollycoddled”. I don’t hear that here in the USA. I understand it’s meaning, but it seems particularly English. Mollycoddled is a peculiarly English word isn’t it? I am not surprised it didn’t cross the Atlantic, but it’s nice to keep a few unique words for ourselves. Such a beautiful glasshouse. I love the bizarre contrast between the elelgant curves of the roof and the towering spire of the agarve. Thank you, it made me smile! This lovely glasshouse is such an anachronism in the otherwise suburban sprawl linking the two towns. It’s an absolute treasure and a credit to those who maintain it for the enjoyment of others. I visited this garden a few years ago and loved the glasshouse I also spent a frustrating half an hour trying to photograph parakeets in the trees…a truly tropical day! Love the agave I do hope that my two don’t grow that huge as I don’t think an 8×6 greenhouse could cope!! You can come to my garden if you want to photograph parakeets – they are everywhere down here now. Our brightly feathered friends are actively being scared off from the site of the agave. Not sure why. Perhaps they have a taste for agave blossom! In Kent. We see more of them in the winter though when food is scarcer. They are the most brilliant green!